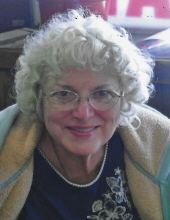 Sharon Hodnefield, age 80, formerly of rural Radcliffe, passed away on Wednesday, November 7, 2018 at Rolling Green Village in Nevada, IA. To send flowers or a remembrance gift to the family of Sharon Hodnefield, please visit our Tribute Store. "Email Address" would like to share the life celebration of Sharon Hodnefield. Click on the "link" to go to share a favorite memory or leave a condolence message for the family.